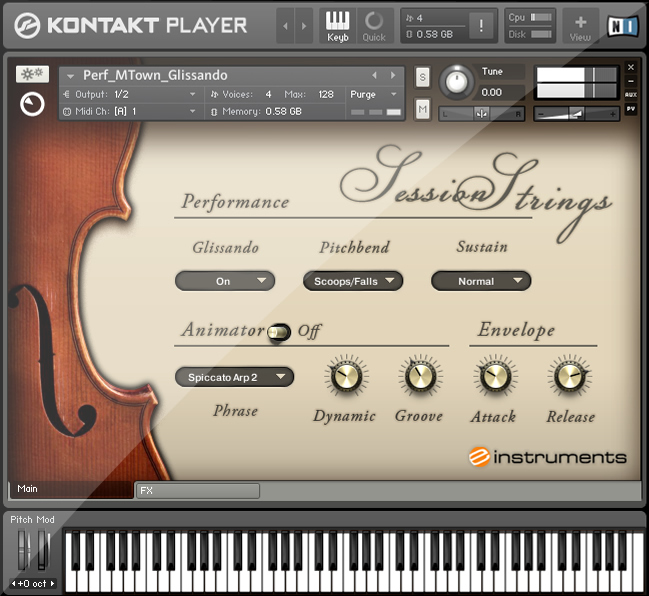 Session Strings, Virtual strings ensemble from Native Instruments in the Session Strings series. Product replaced by the Native Instruments Session Strings 2. 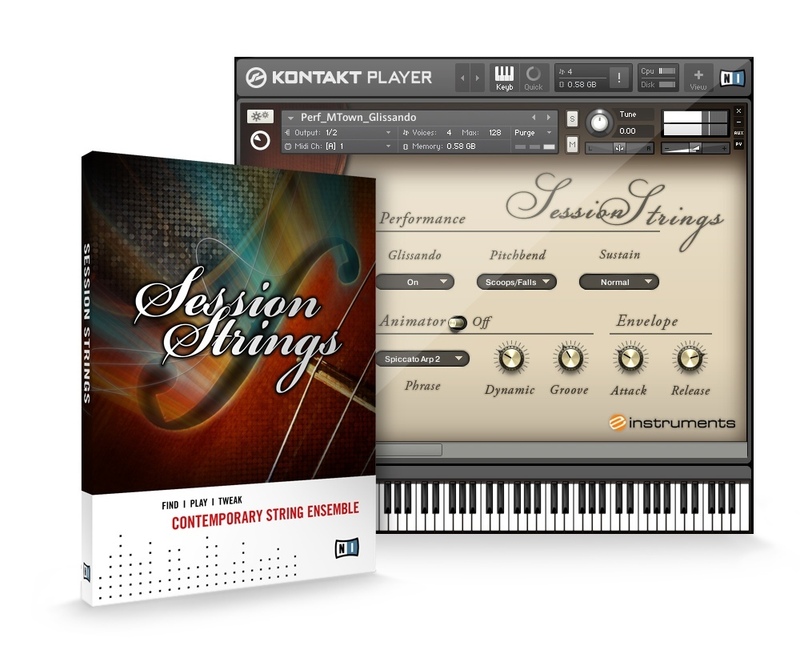 Wedges2's review"Best Strings I Own"
Session Strings is a Mac and PC compatible library that runs on Kontakt 4 or later. 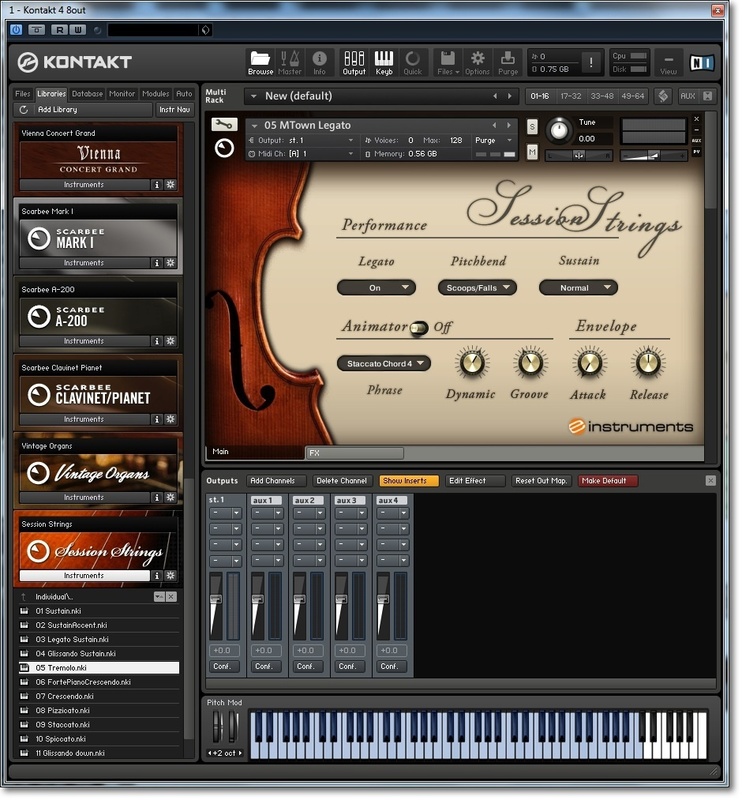 It is very easy to install, as is with other Kontakt libraries. The GUI is very simple to navigate and after some experimenting you'll have a grip on all ot the different string instruments and articulations that are included. 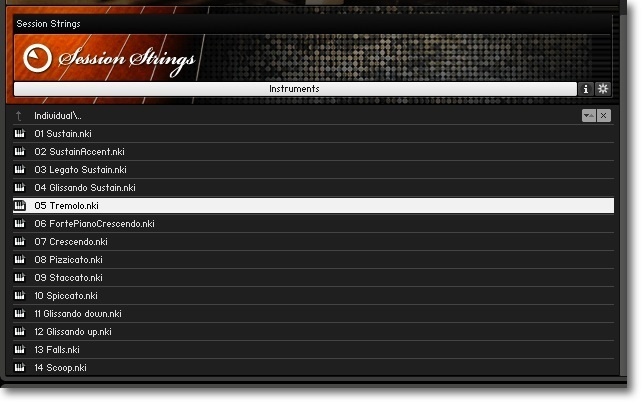 There is a lot of great stuff in Session Strings. The simple legatos all the way to glissando and scoops / falls. All of the patches sound great! There is also a feature known as the animator which is by far my favorite part of the whole package. It allows you to create movie like staccato, pizzicato, etc, rhythms that sounds very real and convincing. Unfortunately, due to the quality of the instruments the CPU usage is very high. On some patches such as basic legatos only about 10MB of ram is used. On glissando patches for example, 500MB of RAM is used. I'm running Session Strings on a Dell XPS Studio 7100 with 6GB of RAM and six cores. 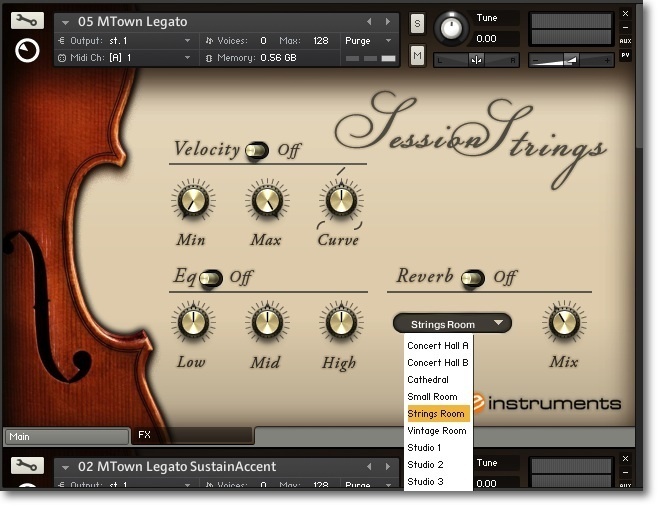 With this set up Session Strings isn't really a hassle to run, but on computers less suited for music Session Strings may be a memory hog. Overall Session Strings is great. If you have the computer to handle it, you'll enjoy great sounding strings in all kinds of articulations and even rhythms thanks to the animator. It's simple, loads pretty fast, and runs smooth. There is a demo you can try, which I encourage you to do so, and if your please the asking price of I believe 180 dollars isn't too bad for the only strings you'll ever really need. After trying Miroslav Philharmonik, VI ONE, and Nexus, I would still make the decision to buy Session Strings. Native Instruments really out did themselves in making this product, and I can safely say that they are the best strings I own. DJ Henny's review"Decent sounding strings that lack a lot." These srings samples were easy enough to install via the Kontakt player and quickly importend into my library. However there was issues with the loading speed of the sounds initially. They worked nicely in Kontakt with no issues at all from then on. There are some nice effects that come with the module for Kontakt but nothing majorly impressive that other third party plugins can't do. The configuration of sound selection is quite confusing though, and there seems to be no difference between the "cinematic" and "single" sounds except for loading times. Beware of this sample pack if you have a slow or low end PC. This sample set does take a long time to load in kontakt and has a heavy cpu load. Lots of the sounds are remarkably poor too for the expectations. I wouldn't even consider it stable as it has been the source of many crashes because of problems loading some wavs of the collection. However this is easily fixable by re-saving the library, but that takes time and even more space on your hard-drive. I have been using this sample pack for a few weeks now and have used pretty much every sound there is in the pack. There is only one real sound that I love from the pack, the rest are distinctly average strings that I would prefer to use Philharmonik over at a lighter memory load and even better sounding. The sound quality is pretty much faultless but every sound is pretty much the same. Knowing what I know I don't think I would have bothered with this pack as it offers nothing that I don't already get from other sources at less hard-drive space too. However I would reccomend this to anyone who's looking for a decent pack of strings for kontakt. Philharmonik is better though. 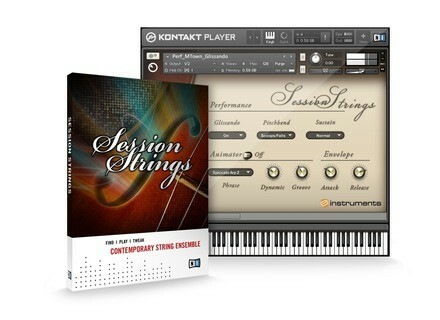 Native Instruments has released version 1.1 of Session Strings, a virtual string ensemble for Kontakt 4 and Kontakt 4 Player.